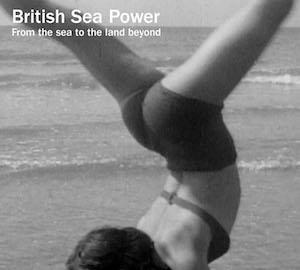 British Sea Power's rather schizophrenic identity has arguably been their commercial undoing. On one hand there's the indie group capable of writing songs with rousing choruses... but possessed of just too much strangeness and smart to really cross over into the territory occupied by the more mainstream groups who, as Roy Wilkinson's excellent Do It For Your Mum rockography painfully points out, often once them. Yet this side of the group seems to have alienated those who might otherwise have enjoyed, on the other hand, their penchant for the kind of epic, thoughtful psychedelia that the ATP crowd go potty for... only as long as its made by North American Continentals in plaid and beard. The band's soundtrack to wonderful documentary From The Sea To The Land Beyond is therefore timely, uniting the two sides of BSP in one seamless, gloriously evocative and accessible whole. The film, made up of footage of the British coast and beyond taken from the BBC archive over the past 100-odd years, was something of a hit when first broadcast on BBC4, gaining record viewings for its Sunday night slot, sending Twitter afire, and getting a terrific write-up from Caitlin Moran in The Times. For many, it seemed that the film acted as an entry point for BSP, beguiled as they were by the graceful dynamics and thoughtful atmospheres conjured up by this most versatile of bands. The 17 track album of the same name is made up of re-workings of music from British Sea Power's decade or so of operation. Occasionally, track titles give a hint as to what the footage from the film would be showing at the time, which helps create an entirely original imaginary film or narrative in the listener's mind's eye. 'Suffragette Riots' reimagines 'Bear' with added helter-skelter of synth and guitar, 'Berth 24' is a rousing take on 'Childhood Memories', with notable shredding by Martin Noble and the added textures of rattling rusty chains as a giant ship is launched. Ghosts of vocals appear now and then - 'Coastguard' gains organ and the "we're all in it when we close our eyes" from 'All In It', before flowing gracefully into "always, always the sea / Brilliantine mortality" from 'Carrion'. 'Bonjour Copains', which is evolved from 'Machineries Of Joy', has ambient pick-up noises that sound like droplets in a cave at low tide, above which a motorik rhythm builds and builds. 'Melancholy Of The Boot', which accompanies the Second World War footage is all roiling chaos, the most violent music the band have ever played, before ending with a violin elegy. It's appropriately poised. The centrepiece of the record is 'Be You Mighty Sparrow', also one of the finest moments of the film, celebrating post-war immigration. Neil Wilkinson (who takes the vocal lead throughout, his softer vocals suiting the wash) sings "And when we get there, we'll go wandering... and here's another thing - we don't want to leave / we're not going home / we are not alone." Take it in companion with their pro-Euro anthem 'Waving Flags' ("You've come so very far / from across the Vistula / Oh welcome in!") it reveals British Sea Power as that rarest of things these days - an English indie group making cogent political statements. For this soundtrack is more than a response to landscape and history alone. What's so striking about director Penny Woolcock's selection of footage is the very human, un-sentimental narrative she weaves. The stars of the film are not the miles of beautiful scenery or the waves gnawing and scouring away at the coastline, but the women (prancing on beaches, balancing on girders and climbing down cliffs, feeding gulls through beach barbed wire, gutting herring and shouting and flashing their bras in neon-lit Blackpool) and men (whittling, marching, diving, riveting, conducting, hauling) who stare, fascinated and mute in the early years of the 20th century, knowing and exhibitionist in the later, into the lens of the camera. It's their memory, and spirit, that British Sea Power celebrate here. Of course, most of the faces, smiling from history at this novel new invention, are now dead. Yes, this film does remind us of things we've lost - a shipbuilding industry, a healthy disregard for health and safety, proper attire on the day-to-day, mass European conflict - but it has nothing to do with dewy-eyed nostalgia. Instead, From The Sea To The Land Beyond (whether encountered with or without the moving image) is a potent and poetic exploration of our own human mortality in contrast with the unyielding permanence of nature and the sea.